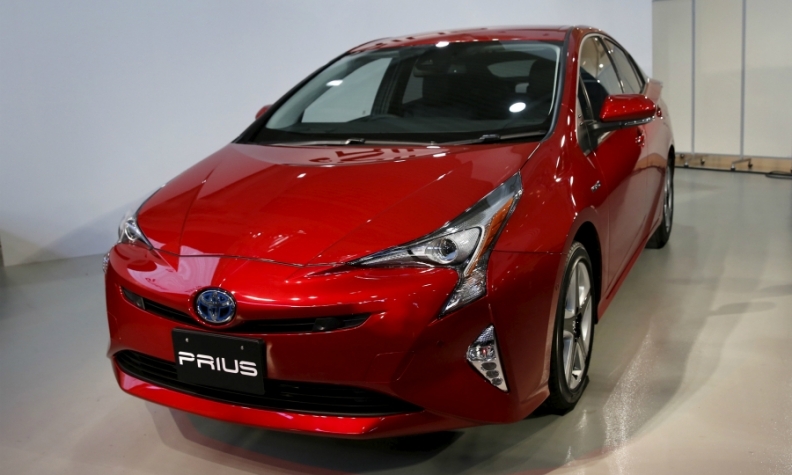 Sales of Toyota hybrids, including the Prius, are rising in Europe. GENEVA -- Toyota Motor Corp. expects to increase its European sales by 5 percent this year to 975,000 vehicles and maintain its market share of about 5 percent, buoyed by the popularity of hybrids, its regional head said on Monday. Speaking ahead of the auto show here, Johan van Zyl said Toyota's sales of hybrid vehicles in Europe rose 40 percent last year and made up 32 percent of its overall sales in the region. For Toyota, Europe consists of 56 countries, including Israel, Russia and Turkey. "We are on our way of achieving our target of having 50 percent of our mix in hybrids by 2020," he told journalists. The executive said the outlook for Europe was clouded by upcoming elections, the UK's pending exit from the European Union and the volatility of the Russian and Turkish markets. He expects industrywide sales in Europe to rise 1 percent this year. He said any increase in the western part of the region would likely be absorbed by some weakness in Britain, and expects some recovery in Russia. Van Zyl said PSA's announcement on Monday that it would buy Opel from General Motors, creating Europe's second-biggest carmaker after Volkswagen Group, would not affect Toyota’s own strategy. "We have no intention at the moment to alter any of our plans with regards to how we're going to compete in the industry, we've got a very clear strategy," he said, adding that Toyota would keep focusing on the minicar, subcompact and compact segments, keeping hybrids as its differentiator. "We are not a volume chaser, we want to create a sustainable, growing business in Europe," he added. Van Zyl said Toyota was fully committed to its operations in the UK regardless of how the negotiations around Brexit pan out, but added that the carmaker was seeking to make the business more efficient. "The prudent approach is always to prepare yourself for the worst-case scenario. If we prepare for that and it’s better, then we are OK," he said. He declined to comment on future production plans there other than saying Toyota "will produce vehicles in the UK." Didier Leroy, Toyota's executive vice president, added that a next-generation fuel cell car the group is developing with BMW will be ready in three to five years, while a separate project to develop a sports car with the German carmaker was ongoing. "The project has been globally approved, that means clearly that we will do it," he said, but declined to give a timeline for when it would be produced.